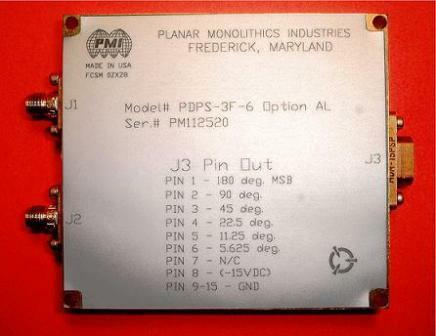 PMI Model PDPS-3F-6 Option AL is a Six Bit Phase Shifter with a Speed of 300 nS Maximum, (100 nS Typical), Designed to Operate at a Frequency of 3.0 GHz with a VSWR of 2.0:1. This Unit has an Insertion Loss of 6.5 dB Maximum and a Phase accuracy of ±6° Maximum, 3° Typical at 3 GHz. Size 3.00" X 2.70" X 0.50"